Earlier this week, Barack Obama's US government enacted two unusual foreign policy moves, abstaining from a UN resolution about Israeli settlements and the extremely provocative move of expelling Russian personnel from the country (in response to "Russian hacking" for which no credible evidence has come to light). Luckily for world peace, the measured Vladimir Putin has brushed off Obama's tantrum and once again made the lame-duck-in-chief look like a petulant, idiot child. There have been an awful lot of planets in the 20-degrees-of-a-sign range this week (Jupiter, Saturn, Chiron, and Uranus). 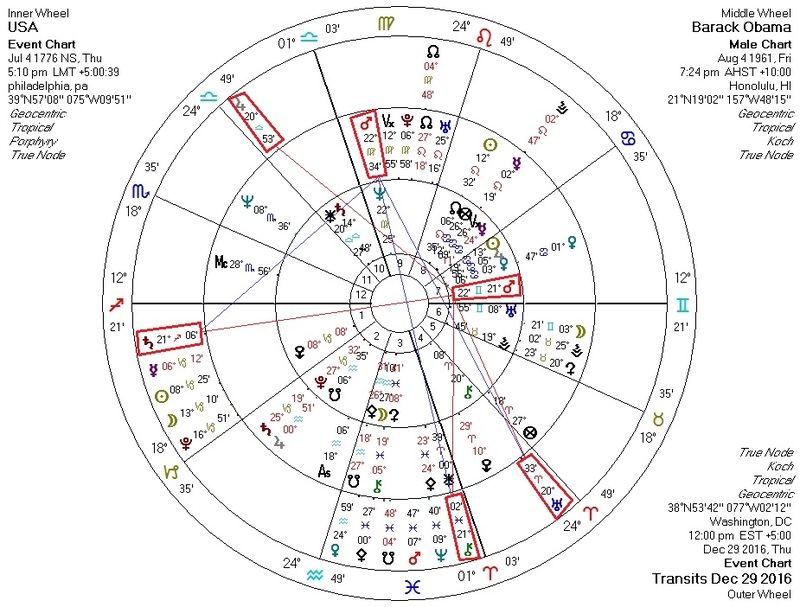 This means that Mars on the charts of the US and Barack Obama (and to a lesser degree Vladimir Putin) is being triggered heavily by transit. Themes we might expect from the planets involved are action (Mars), public/foreign policy (Jupiter), authority (Saturn), injury (Chiron), and surprise (Uranus). All of this is very standard modern Western astrology. 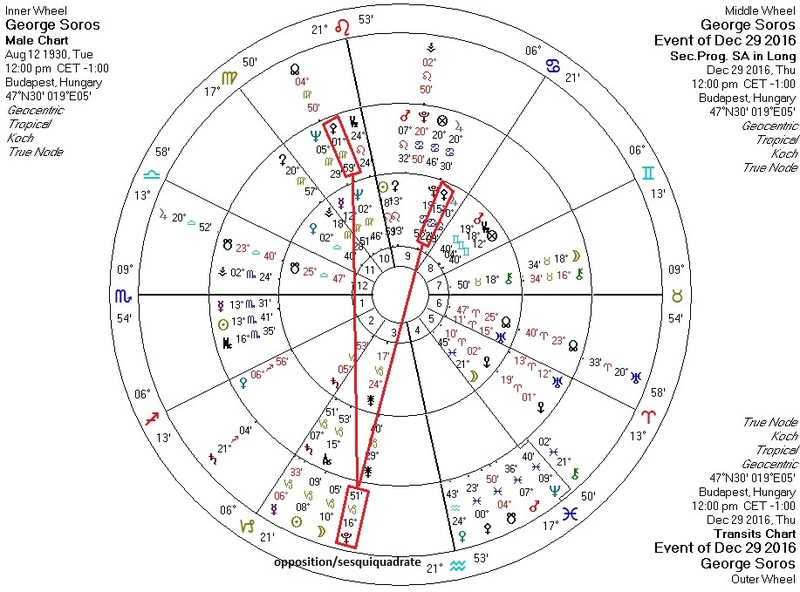 On top of this, however, we've seen in numerous other blog posts that potentially catastrophic decisions are generally accompanied by a Pluto-to-Pallas transit on the chart of the "decider". And while the US chart does show such a transit (same one as here), Barack Obama's does not. Who, then, is behind our "White House Hissy Fit" if not the presumed "leader of the free world"? I posit that it may be a man who is undergoing such a Pluto-to-Pallas transit at this moment, one whom many educated observers opine is the real "power behind the throne" for the Democrats: George Soros.